Many moons ago, I went travelling around the world with a very close friend of mine. We lived out of less than glamorous rucksacks that left creases in all of our clothes and lightly fragranced them with a delightful Millets-style canvas scent!? Despite all the ‘roughing-it’ of these travels, I still insisted on taking my heels with me wherever I went and was often referred to as the ‘high-heeled backpacker’ – thoroughly impractical but then I never was the type for sensible, unflattering hiking boots – urgh, I shudder at the thought!? As I’m sure you know, back-packing comes with all the style and glamour of a pair of buckle-up sandals – with plenty of grotty hostels and cheap food, however I can assure you that I have since thoroughly left those ways behind me and I am now enjoying revisiting the places I went to, but this time staying in much more pleasant and luxurious surroundings! One on the stops on my wonderful round-the-globe-trot was the Cook Islands in the South Pacific, not as well know as Fiji, but they will always have a special place in my heart as it was my home for a month or so. 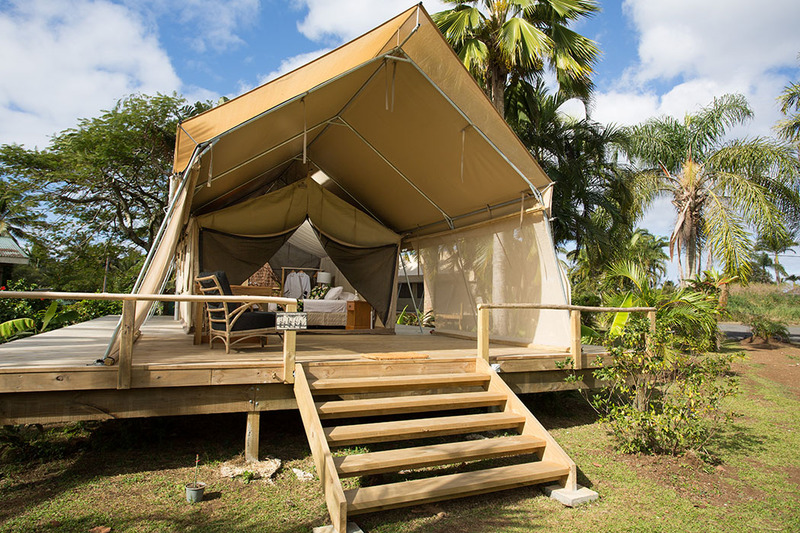 From the moment you arrive in Rarotonga (the main island of the Cook Islands) at the open-air airport, the great outdoors immediately beckons you to its beautiful beaches and lush green mountain ranges. 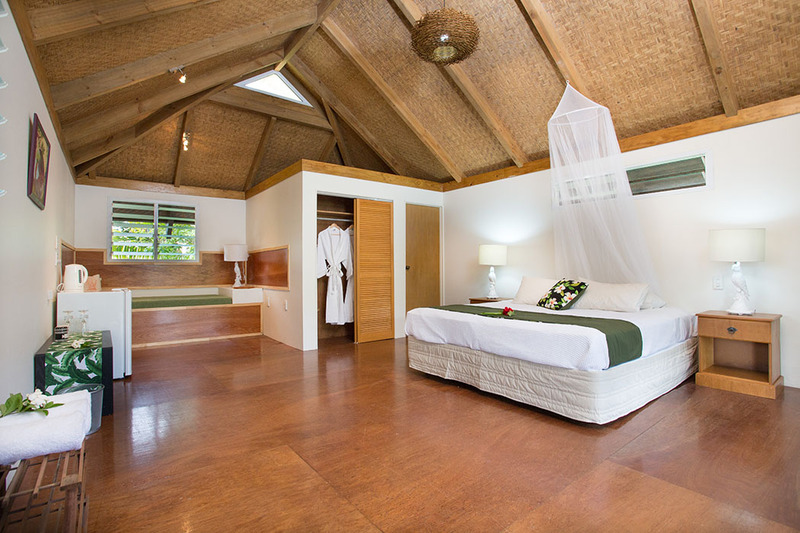 Because of the gorgeous surroundings it seems wrong to stay locked up indoors in a resort or hotel when visiting a pacific island like this that’s bathed in sunshine (and experiences the occasional torrential tropical downpour that’s as blissfully warm as your shower at home) so, I have found Rarotonga’s only eco retreat and glamping style hotel, the Ikurangi Eco Retreat. 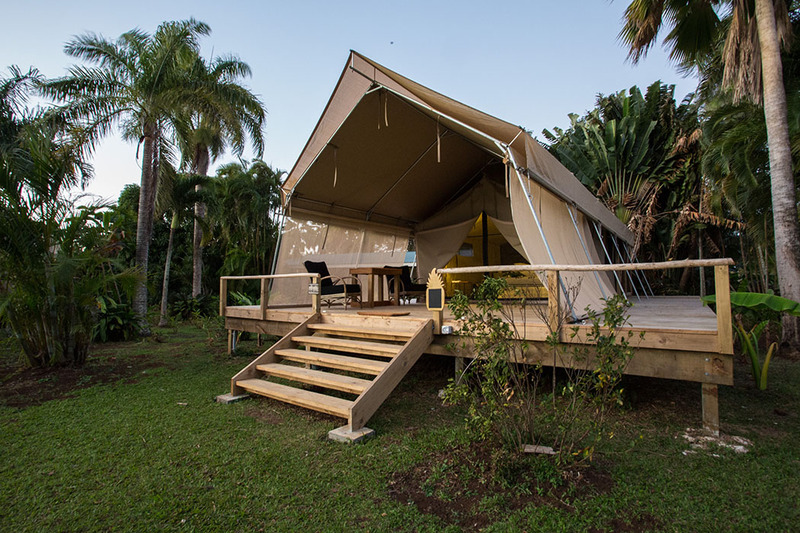 With views over the Takitumu mountain ranges, the eco retreat comprises of four Luxury Safari Tents perched upon private timber decks as well as two Polynesian ‘Are’ Studios. 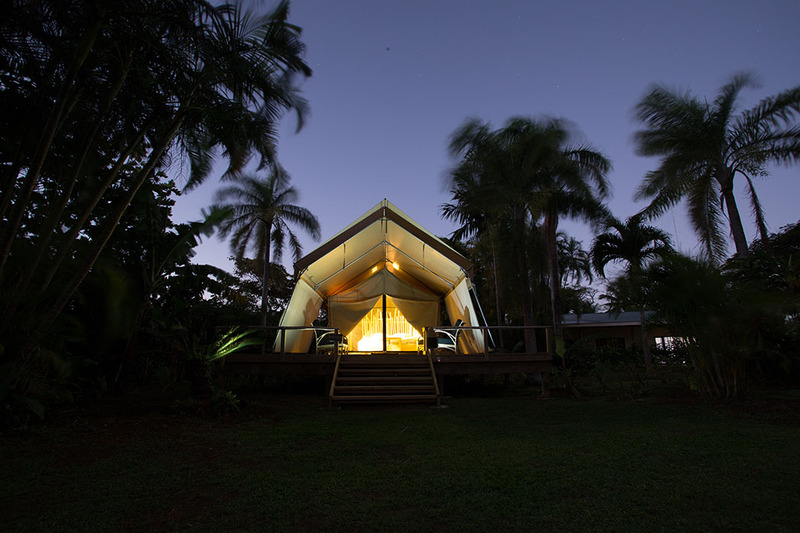 Everything at the retreat is eco-conscious and based around the concept of causing as little impact or damage to the environment as possible. 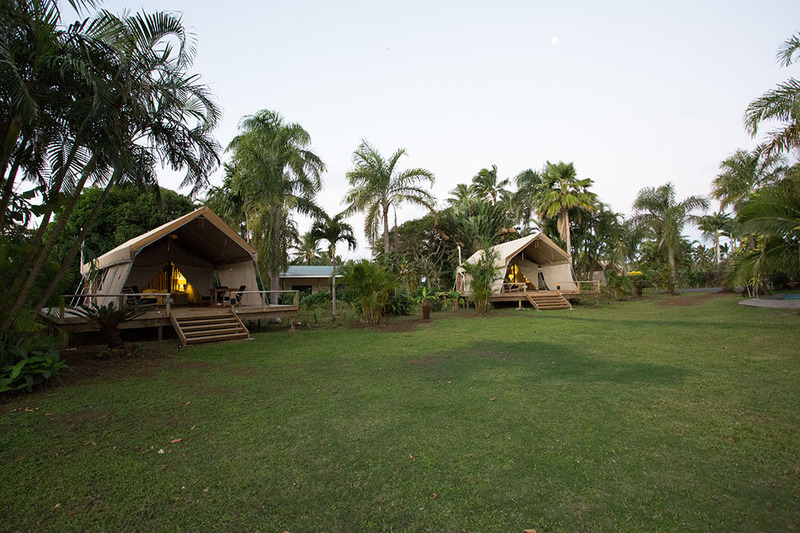 Each of the tents are equipped with home comforts including a king-size bed, electricity, hot water and a bar fridge as well as all the amenities you would expect from a boutique hotel: luxury waffle robes, hair dryer, iron & ironing board, tea and local artisan coffee facilities and natural bathroom amenities from Kiwi brand, Eco Store. 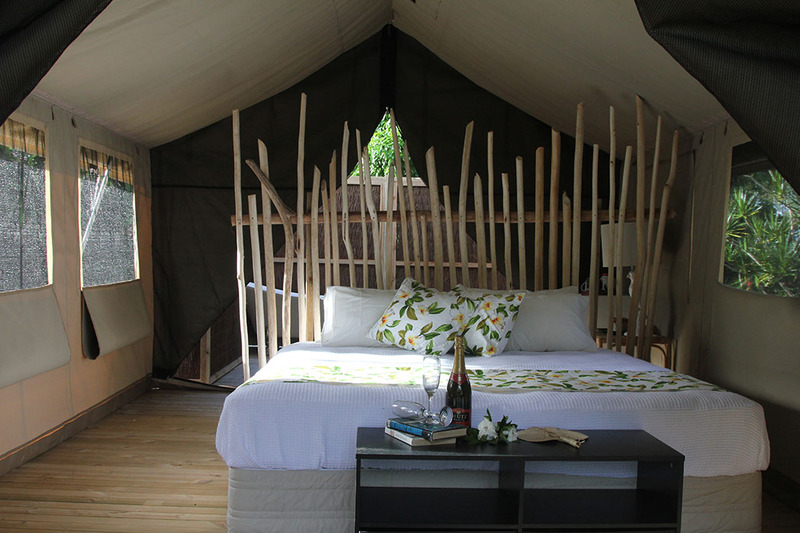 Each tent features fully screened windows (to keep out the mozzies – don’t forget your Deet! 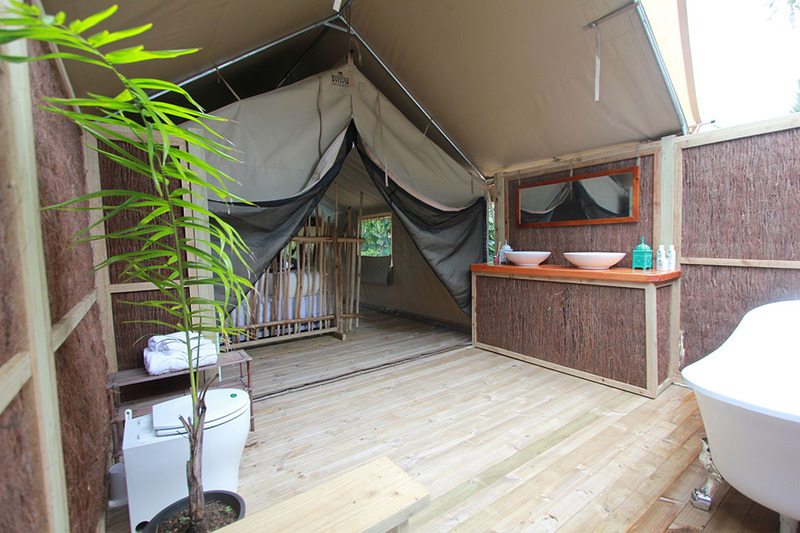 ), pedestal fan, private en-suite with modern composting toilet and private outdoor rainmaker shower and outside your tent you will find a large timber deck area furnished with a table, sofa and chairs to relax in whilst enjoying a sun-downer. 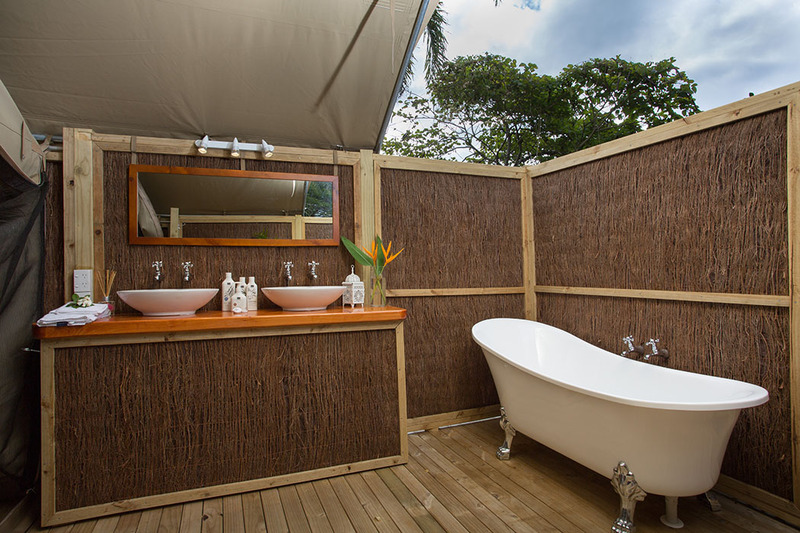 If you want a little more luxury you can choose the Ariki Safari Tent, the retreat’s most exclusive and luxurious tent (often reserved for honeymooners) which comes with a claw foot bath no less and champagne on arrival! 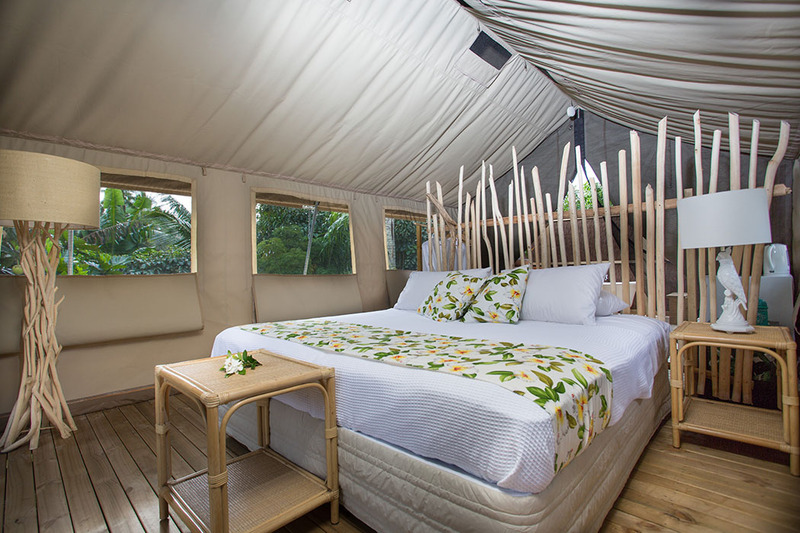 If a tent is not to your liking however, you can choose to stay in one of the two Tropical ‘Are’ Studios which have been decorated with a true Polynesia feel and feature high ceilings, king-size bed, private en-suite, indoor daybed and a private deck facing the mountains. Whichever accommodation you decide to choose in the morning you will be greeted with a tropical breakfast delivered right to your door featuring a selection of fresh fruit, artisan breads and muesli – lovely! 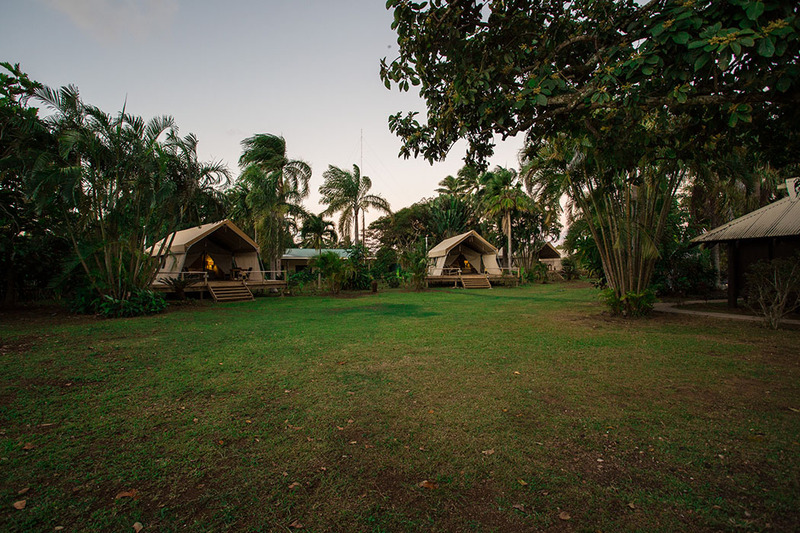 There’s plenty to do on this tropical paradise island from jeep safaris; to touring the local Matutu brewery; to swimming at the lagoon-like Muri Beach and exploring the inland trails of Takitumu. There is a local bus (which sometimes runs on ‘island time’ so disregard the schedule!) 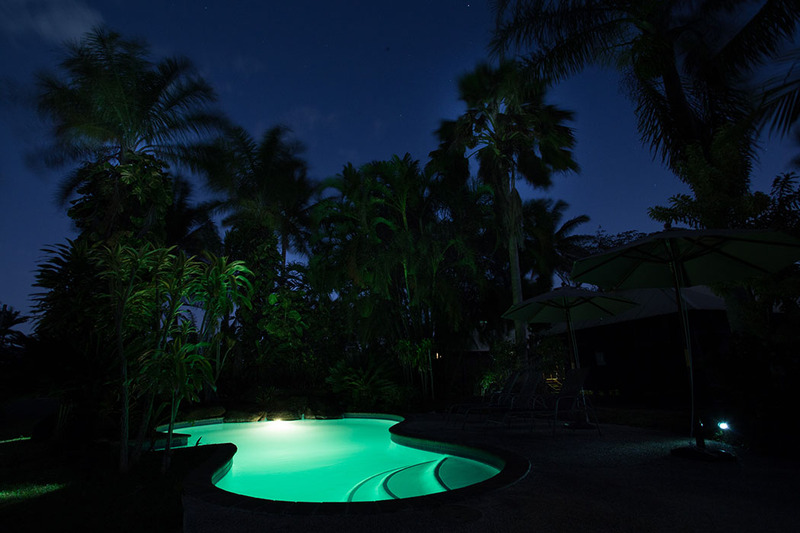 that offers trips around the island stopping off at numerous points or you can hire a car to take in the sights and sounds of Rarotonga. 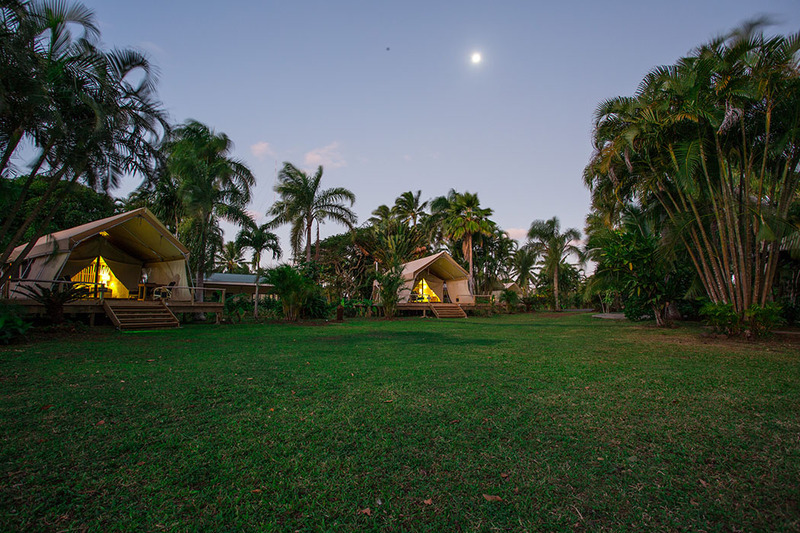 The Ikurangi Eco Retreat provides complimentary bicycles and snorkelling equipment to allow you to explore the wild side of this stunning island and they can also arrange private yoga sessions with their own Yogi Maya in the gardens of Ikurangi. Rarotonga has a number of culinary treats on offer including delicious freshly caught seafood at The Mooring, more-ish light snacks and coffees at The Waffle Shack in Avarua and my personal favourite is Trader Jacks which serves generous gastropub style cuisine with some delicious seafood variations all overlooking the water of the Avarua harbour and out to sea, perfect for watching a beautiful pink sunset in the tropical breeze. And if you crave your usual daily caffeine boost then the famous Dearlove artisan coffee shop is just a few minutes cycle or walk from the retreat. 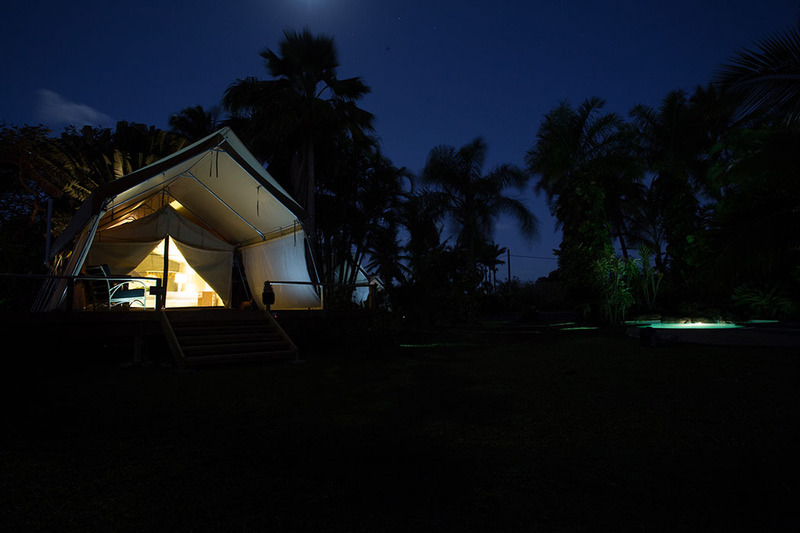 The friendly team at the Ikurangi Eco Retreat are always more than happy to recommend a place to dine or book a table for you and if you fancy something a little different they can even arrange a personal chef to cook for you under the stars in their tropical garden – very romantic! 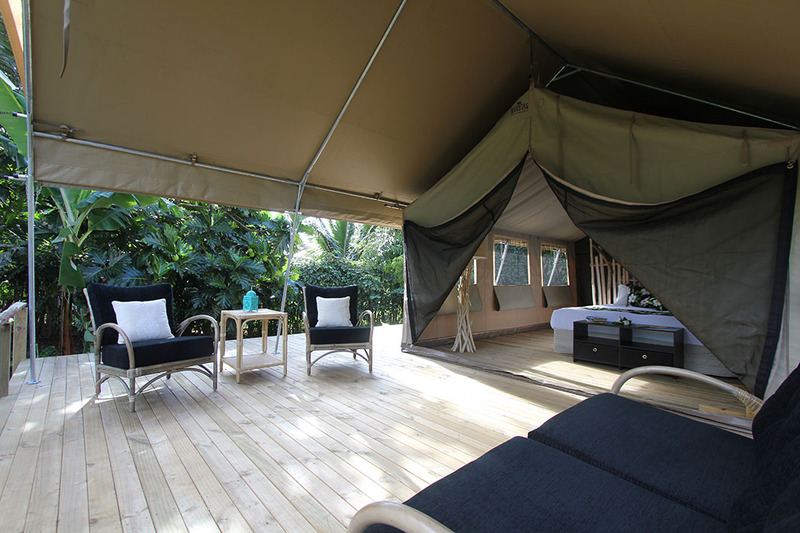 Ikurangi features in my top 3 best glamping resorts in the Pacific Islands.